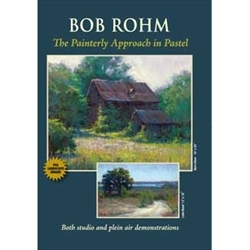 Bob Rohm The Painterly Approach in Pastel - This landscape pastel DVD demonstrates Bob's Painterly approach to pastel painting both in the studio and on location "en plein air". The first demonstration is painted in the studio using a photo reference, and details his process step-by-step from developing the compositional shapes and underpainting with hard pastels through the color and value relationship, establishing the "extremes" and the finishing touches with the softest of pastels. The entire Painterly Approach is covered. Bob's painting, "Barn Glow", 16x20 won a Pastel Society of America Landscape Award. Demonstration two, "Lake Road", 12x18 is painted on location and cover the process of working outdoors - including what to look for when selecting a location and how to deal with your materials and the changing conditions.